MARTINSVILLE, Va. – In the 2018 season’s first three months, NASCAR’s Camping World Truck Series has only four races. It’s a schedule a driver doesn’t like, but Ben Rhodes admitted Friday the lengthy breaks at the season’s beginning were good for ThorSport Racing which switched from Toyota to Ford this year. “Even though we’re not at the race track we can use this time for every ounce that it’s worth,” Rhodes said at Martinsville Speedway during preparations for this weekend’s Alpha Energy Solutions 250. ThorSport announced its switch to Ford just three weeks before the season opener at Daytona. 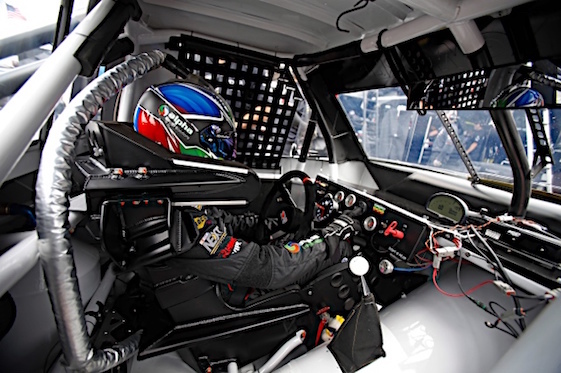 Without sufficient time to construct trucks for its four drivers – Rhodes, two-time truck champion Matt Crafton, Grant Enfinger and rookie Myatt Snider – Rhodes had to pilot a backup BKR (Brad Keselowski Racing) truck at Daytona. The series then had two more races before a two-week break. After Martinsville, the series has five weeks off before it resumes racing May 4 at Dover. Rhodes believes the team’s transition to Ford has been good. “I love the way Ford has welcomed us into the family with open arms, but at the same time I would love to have gotten into the wind tunnel, some other resources a little sooner,” Rhodes said. But he noted it was “hard enough” just to get the trucks built for Daytona. “The first three races, we were just trying to get through them,” Rhodes commented. “Now … I think we’ll be doing pretty good,” he said.